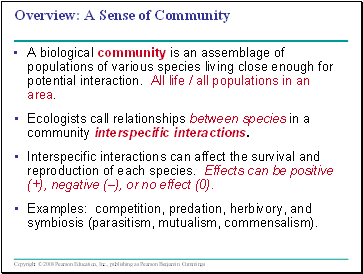 A biological community is an assemblage of populations of various species living close enough for potential interaction. All life / all populations in an area. Ecologists call relationships between species in a community interspecific interactions. Interspecific interactions can affect the survival and reproduction of each species. Effects can be positive (+), negative (–), or no effect (0). 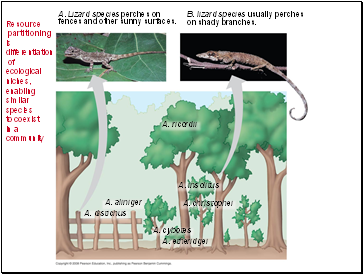 Examples: competition, predation, herbivory, and symbiosis (parasitism, mutualism, commensalism). 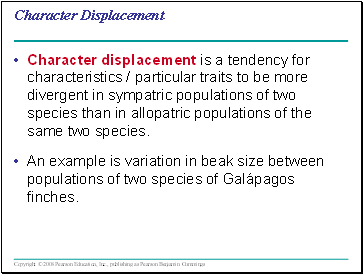 Interspecific competition (–/– interaction) occurs when different species compete for a resource in short supply. Strong competition can lead to competitive exclusion, local elimination of a competing species. 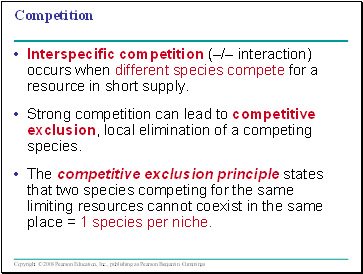 The competitive exclusion principle states that two species competing for the same limiting resources cannot coexist in the same place = 1 species per niche. The total of a species’ use of biotic and abiotic resources is called the species’ ecological niche. 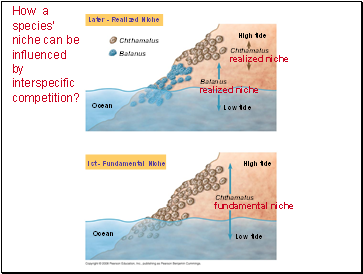 An ecological niche can also be thought of as an organism’s ecological role. Ecologically similar species can coexist in a community if there are one or more significant differences in their niches. 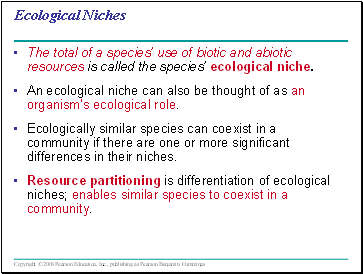 Resource partitioning is differentiation of ecological niches; enables similar species to coexist in a community. fences and other sunny surfaces. 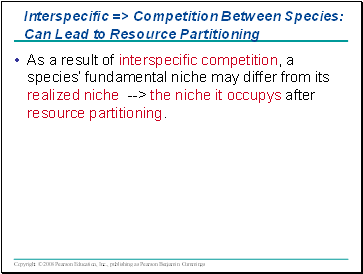 As a result of interspecific competition, a species’ fundamental niche may differ from its realized niche --> the niche it occupys after resource partitioning. How a species’ niche can be influenced by interspecific competition?